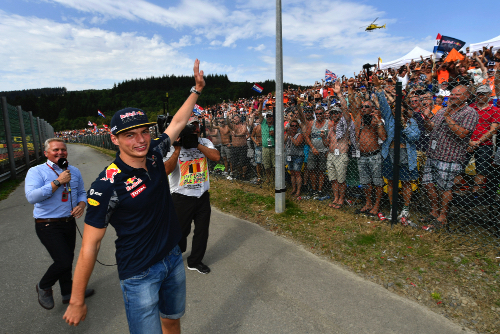 The F1 world rounded on Max Verstappen after Sunday's Belgian grand prix, insisting the Dutchman is driving too recklessly. "I am fine with good, hard racing but that was not correct," said Ferrari's Kimi Raikkonen after his battles with the popular 18-year-old Dutchman at Spa. "I've never had that before with any driver," the Finn charged. Earlier, Verstappen was involved in a first-corner clash with both Ferraris, and Sebastian Vettel said he would be seeking out the Red Bull driver for talks. "We need to talk to each other and respect each other," said the German. "I believe the criticism is justified but we should not make too big a story out of it. I like him, he's aggressive, but some of his manoeuvres, especially when braking, are in my opinion not correct." Mercedes' two drivers were not involved in the Verstappen manoeuvres on Sunday, but that did not stop team chairman and boss Niki Lauda and Toto Wolff from commenting. "Kimi's criticism was fully justified, and he (Max) needs a psychiatrist if he says it was Kimi's fault," triple world champion Lauda told RTL. "The young man is a talent of the century, but if he has no understanding of doing something wrong, I'll talk to his father Jos and tell him to speak with his boy. It was well above the limit," he added. Wolff also said he likes Verstappen and his aggression, comparing the impression the youngster is leaving on his rivals as "reminiscent of Hamilton or Senna -- as long as it goes well". "Eventually it will end in the wall and I think we're not far away now", the Austrian said. Red Bull chief Christian Horner, however, defended his driver. "I'm surprised that Toto has commented on something that actually does not concern him. Max goes to the limit -- it was certainly borderline," he said of the Spa incidents. "But the stewards saw no reason to initiate an investigation." However, Wolff added: "The FIA did not punish him but he will have to endure a difficult driver briefing (at Monza). "In my eyes, he is refreshing but also dangerous."